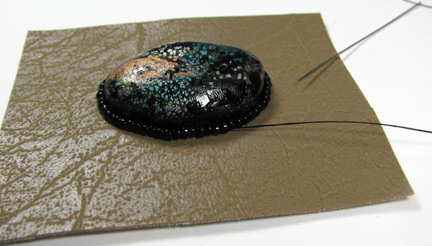 Last week, part one of this tutorial covered how to make these sparkling polymer clay cabochons. 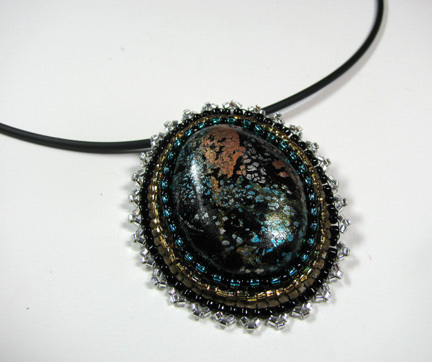 Today, I want to share with you one way to construct a wearable pendant from one of the cabs. For more specifics on bead embroidery or more details on each of the stitches and steps listed below, please download my free e-book chapter of Every Bead Has a Story. 1. 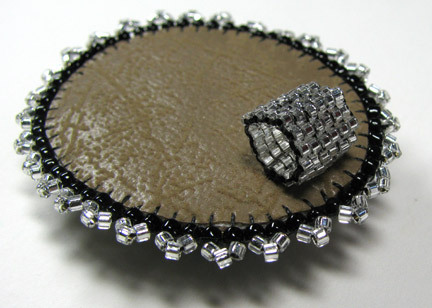 Glue to a piece of soft suede-like fabric and back stitch around the cabochon. Use an even number of beads. 2. 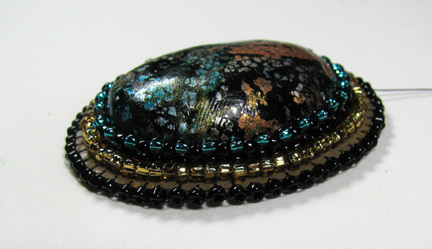 Use peyote stitch to build up a bezel around the cabochon. Add another row or more of back stitch. 3. Cut out the embroidery with a scant 1/8th inch of extra fabric. Lightly glue the piece to the wrong side of some backing fabric (I used the same suede-like fabric for both top and bottom). 4. Cut the backing off even with the top and add edging brick stitch all around the edge. 5. Add a picot stitch around the outside. 6. Stitch a square stitch band to the back of the cabochon near the top and connect it into a loop. 7. Slip a cable necklace through the loop. Cyndi, that is a beautiful pendant! This is one technique I have yet to try. Thanks for the great instructions. The pendant is beautiful Cyndi. 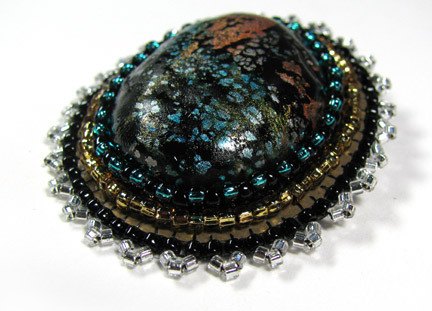 I have a big oval jasper bead that I'm gong to do this to. 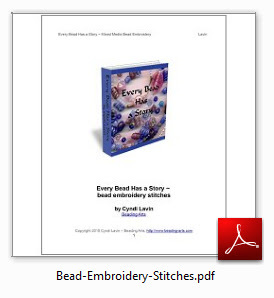 Are all of those bead embroidery stitches covered in your book, Cyndi? I had to go look at the chapter outlines, Eileen, sorry! All of the stitches except for the square stitch bail are covered in the first chapter, which is free :-) The bail is in chapter 3. That is just GORGEOUS! Seriously beautiful Cyndi!